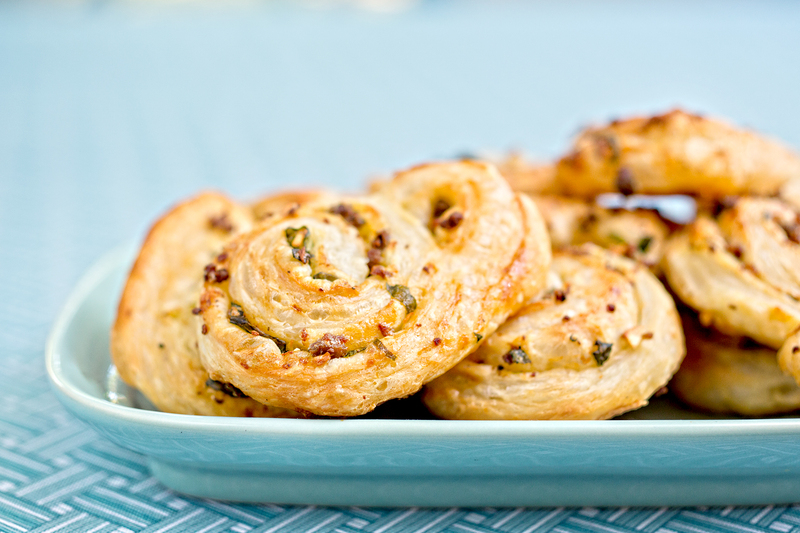 Not all camels have two humps; why should all palmiers have two? Can we start by saying: I. Love. Palmiers. The addiction started when one of my besties decided to become a baker, and shortly thereafter decided to throw one of those holiday cookie swaps. Everybody had their sad, sorry, misshapen “family recipe;” I had my weird rooibos sablés. Then my friend whips out these delightful, heart-shaped, melt-in-your-mouth, magical, sugary, buttery disks of deliciousness. She makes the best palmiers, needless to say. 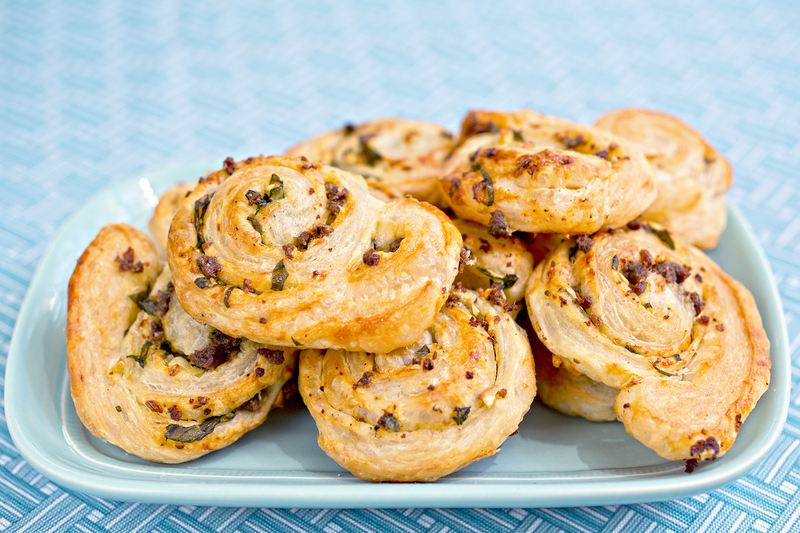 Since I like savory over sweet, I thought a meat and garlic-filled version of palmiers would be delightful. I don’t make my own puff pastry from scratch, like my dear friend. However, the store bought sheets do the trick well enough and save loads of time. The one trick was that I did not flour my work surface. This led to a very sticky situation indeed, as I couldn’t roll them into the traditional palmier because the dough was sticking to my cutting board. While the dough wasn’t completely ruined, I did have to scratch the “doubling scrolling” effect and roll them into simple pinwheels. Do you want to know a secret? They taste the same. However, if you want the pretty hearts, flour your work surface. At the end of the day, regardless of the shape you manage to acquire, bake them no matter what. Nobody cares what they look like. Heat a pan over medium-high heat. Cook the sausage, making sure to break the meat up into very small pieces. Set aside to cool. Meanwhile, melt the butter with the garlic. Either on the stove or in the microwave. Unfold the puff pastry on a floured work surface. Drizzle the butter/garlic mix on the puff pastry. Sprinkle with the meat and cheese. Then roll into one big spiral. (Or two spirals that meet in the middle if you want the traditional palmier shape). Slice the log crosswise into about 1/2 slices and lay them on a baking sheet lined with parchment. Brush the top with the egg wash and sprinkle with more grated parmesan. Bake about 15 minutes, until golden brown. Let cool slightly and serve either warm or at room temperature.